'Anyone interested in military history or indeed history in general will find it fascinating to read.' Spectator. What If? is a collection of counterfactual essays dealing with military events. 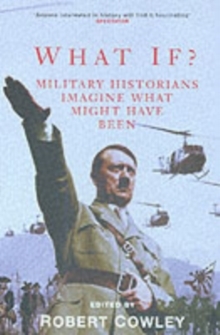 Concentrating on some of the most intriguing military history turning points of the last 3,000 years, twenty celebrated historians, including Alistair Horne and John Keegan, have come together to produce a group of essays that enhance our current understanding of decisive events. 'Pure, almost illicit pleasure. What makes these essays tremendously diverting is how little they strain one's sense of credibility.' Andrew Roberts, Sunday Telegraph. 'These informed, elegant essays authoritively analyse incidents over the past 3,000 years.' The Times. 'One of the delights of the book is that broad speculative analysis is built from a mass of exciting detail.